Super Hero Boy: How on earth does this thing work? How on earth does this thing work? I am totally blown away by the Crayola Glow Station. Its the oddest thing and honestly I had no clue how it worked and it drove me a little nutty so I had to do some poking around. To sum it up the Crayola Glow Station is basically a large plastic sheet which you can hang, lay flat, and pretty much use anywhere. Unlike many Crayola products it can be used over and over and over again. I looked all over to try to get an explanation on exactly how it works, with no luck, so I will just attempt to explain it myself. When you first take the drawing surface out of the box it doesn't look like anything much but the magic happens when you get the glow pen out. The glow pen is a pen with a super bright flashlight tip. When you "write" on the glow board itself everywhere the light pen touches the board (or even comes close to it) the background glows. You can write glow in the dark messages, draw spaceships, or even make designs with the included stencils and wand tip. The beauty is.. you draw your picture and anywhere from 30 seconds to minute your drawing just fades away. So you can just keep drawing and drawing and drawing and no paper, no markers to buy, nothing other than the ocassional batteries. The downpoint is that your drawings are gone forever, but there is a solve for that. The set comes with a dry erase marker which you can use the transfer sheet and dry erase marker to transfer your images either to your glow board (you can draw a drawing then transfer it with the glow pen, or you can use the transfer sheet to transfer your favorite images off of the glow station) Its actually kind of neat as if you use the transfer sheet to transfer images onto the glow station it makes an inverse image, the background glows and the image does not. Overall its a super neat drawing board that can be used as often as you like which makes it very inexpensive and portable. You can use it anywhere and no worries about getting markers all over the car seats, grandmother's walls, or worrying about running out of paper. 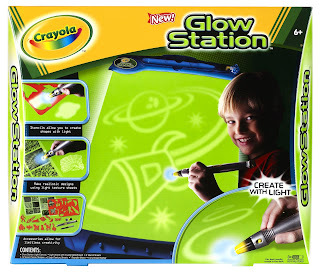 The Crayola Glow Station is available directly from the Crayola Store or you can pick one up on Amazon!